Japan's Arase spacecraft (formerly called ERG) observed chorus waves and scattered electrons in Earth's magnetosphere, the origin of pulsation auroras. The scattered electrons precipitated into the atmosphere, resulting in auroral illumination. The origins of intense flickering displays of light high up in Earth's atmosphere are now revealed after a decades-long hunt, a new study finds. Similar auroras may take place high above Jupiter and Saturn, according to the scientists behind the new research. Auroras result when streams of high-speed particles from the sun — collectively known as the solar wind — slam into Earth's magnetosphere, the shell of electrically charged particles trapped by the planet's magnetic field. Whereas discrete auroras originate a few thousand miles above Earth's surface, pulsating auroras arise about 10 times farther away. Previous research suggested that pulsating auroras were triggered by electromagnetic fluctuations known as chorus waves that arise in the magnetosphere at the equator. The idea was that chorus waves send electrons in the magnetosphere hurtling along the planet's magnetic-field lines toward the upper reaches of Earth's atmosphere, generating light when they collide with molecules of air. However, for decades, scientists could not gather sensitive-enough ground-based and space-based observations to line up at the right time and place to prove this model. Now, researchers have finally collected direct evidence of the chain of events behind pulsating auroras. The scientists analyzed data from the Arase spacecraft, which was launched by the Japan Aerospace Exploration Agency in late 2016. 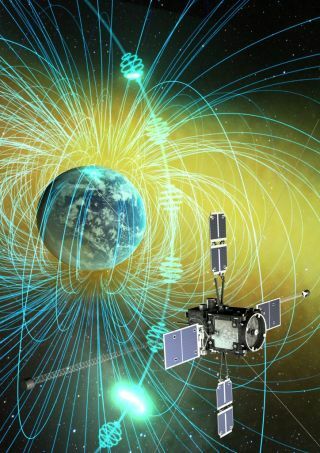 This satellite could both detect chorus waves and investigate their effects on magnetospheric electrons within a narrow window around a magnetic-field line. The researchers also pinpointed where the magnetic-field line the Arase spacecraft examined made contact with Earth. They searched for any pulsating auroras matching electron activity triggered by chorus waves. The scientists identified an aurora in 2017 in central Canada that was apparently generated by magnetospheric electrons scattered by chorus waves. "Observational results are usually very complex, and tests of theoretical predictions often result in ambiguous results, which was not the case here," said study lead author Satoshi Kasahara, a space and planetary physicist at the University of Tokyo. The researchers noted that similar activity may occur in the auroras of Jupiter and Saturn, where prior work detected chorus waves. "Application for other planets would be exciting," Kasahara told Space.com. The researchers detailed their findings online today (Feb. 14) in the journal Nature.